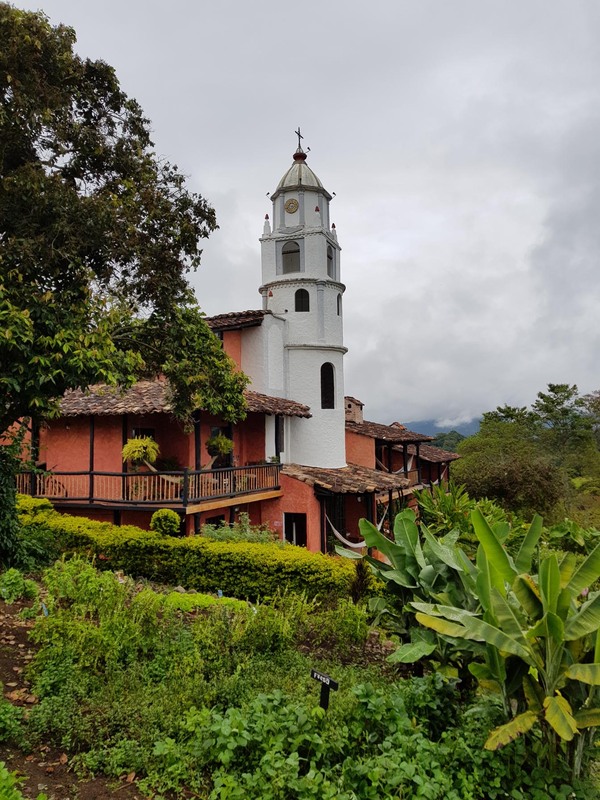 Our visit to Colombia was only two weeks and we spent the first week visiting specific places. I have fewer general comments about Colombia as a result. Our Airbnb rental was eight days, much shorter than usual. Our experience shows the ups and downs of Airbnb. Our host texted us GPS coordinates, and Jonathan recognized the house from the Airbnb listing. As I mentioned, the place was gorgeous, but when we arrived, the host was not there, left no message, no booklet of carefully worded instructions. There was a caretaker whose job was to open the gate across the driveway as we went in and out, water the garden and clean the pool. There was no wifi and the local phone signal was minimal. We never book a place without wifi and had no idea what happened. The house was completely empty of food, too. There was no welcome basket of fruit, bottle of wine, loaf of bread, butter or bottle of milk in the fridge as we sometimes find. There was not even salt, and it was 5 pm on Friday evening. We asked about a grocery store and found the nearest was 20 km back the way we came. With no alternative we set off again. We rented a car at the Barranquilla airport, and though the checkout took a long time, we had no trouble with the car. 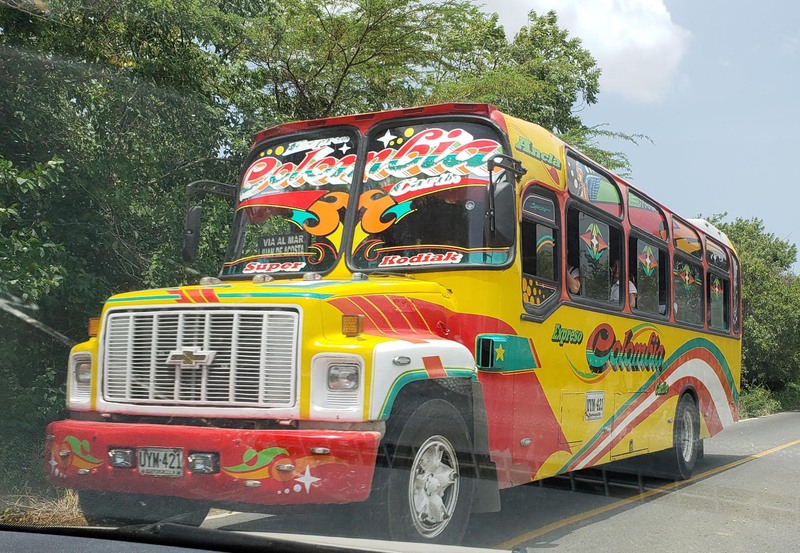 We were warned that visiting Santa Marta and Cartagena required checking to make sure that the car wasn’t banned from the city that day (It depends on the last digit of the license plate). We were also warned about speed cameras and police stops, though as far as we can tell we did not run afoul of any of the cameras and we were not stopped by the police. Like every country, Spanish is spoken in its own way in Colombia, and we had little trouble being understood with our Peruvian vocabulary. It was sometimes difficult to understand the directions we were given. Many people speak some English, though our waitress at La Perla seemed relieved that she could bring us Spanish language menus. Outside of cities we didn’t run into a lot of English speakers. 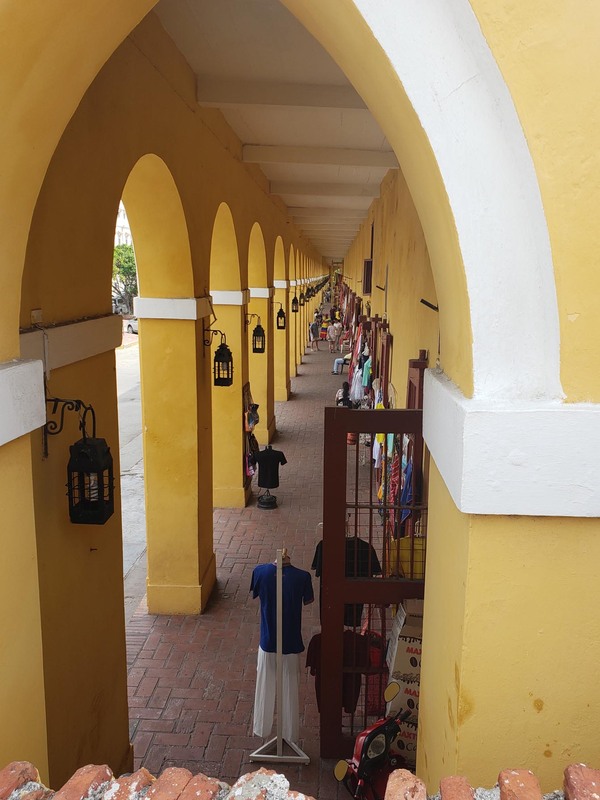 There are lots of handicrafts available in Colombia, including woven bags, hats, leather goods that seem to be mostly handbags, and lots of souvenirs. 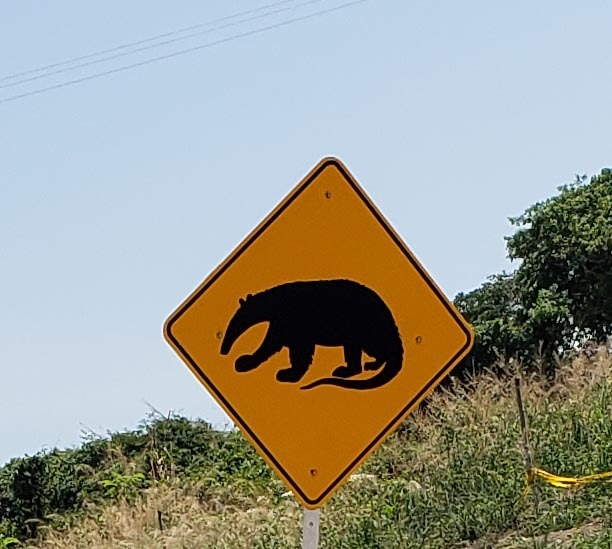 The border with Panama seems to be influential as there are lots of molas for sale and things made from molas, like bags, hairbands, clothing, and even shoes (I bought a pair). There are lots of beaded necklaces and earrings hung on boards in the street, especially calle 7 in Bogota. 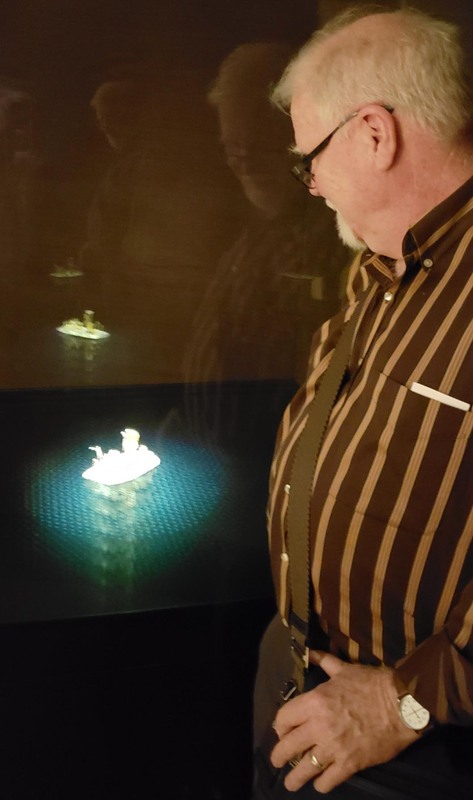 We saw two spectacular “spirit boat” carvings made by Amazonian people, one in the gift shop of the Museo de Oro and another in a shop in Cartagena. Both were too large and too fragile to get home easily. Most restaurants and service businesses in Colombia add a 10% “propina voluntaria,” or voluntary tip. We paid the tip every time and when I tried to ask a waitress whether the tip could be removed from the bill if a customer was dissatisfied, she said yes, but in a way that suggestedl it would be awkward to decline this “voluntary” donation. We did decline to tip the guy who stood in the exit of a parking lot that we had already paid to enter. The sign says it all. 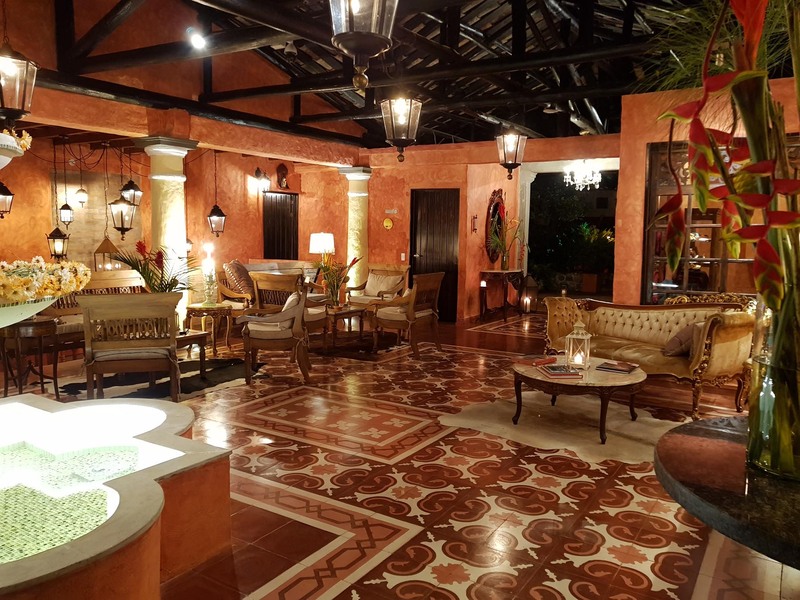 We arrived in Cartagena, one of the oldest cities in the New World founded in the 1500s. It has survived all these years despite colonization, wars and heat. 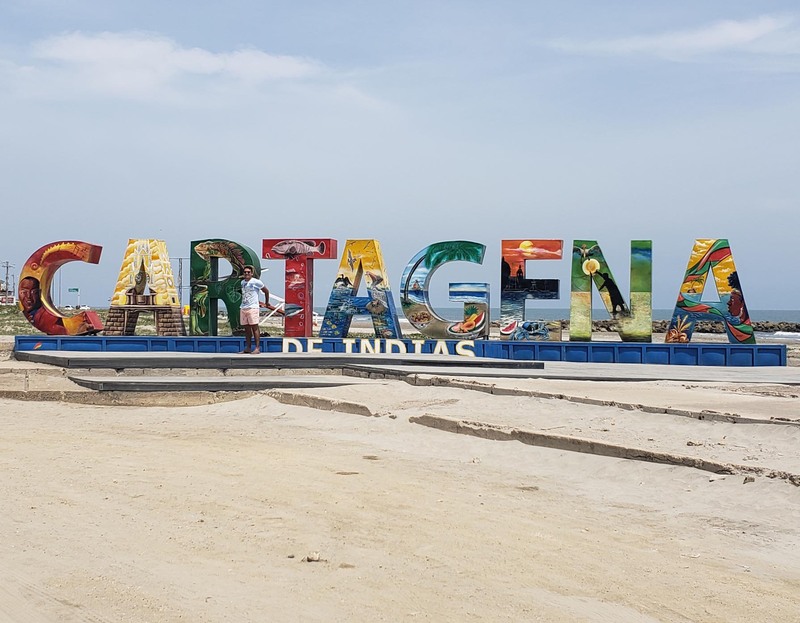 Many places are suffering from high heat this summer, but Cartagena is always hot and humid. Hot, hot, hot, and sweat-dripping-from-every-pore humid. We enjoyed strolling the walled city, window shopping, having a coffee and wifi access, chatting with the café owner who is back in the area after 20 years in Florida–his accent, or lack of it, gave him away. We stopped for lunch at La Perla, run by the people who run the Peru sushi restaurant next door. Our Peru-inflected food was delicious, including shrimp ceviche Cartagena style in a spicy tomato sauce, oxtail and blue cheese filled appetizer puffs, and ravioli with shrimp and crab. The air conditioning felt delicious, too. Houses are carefully painted and decorated, often with lizards. The arcades are remodeled storage from earlier times when the arches housed storage for mariners or the fort. Today, vendors offer woven goods, leather bags, and souvenirs. As we headed back to the car, we stopped in a store to buy some Colombian chocolate for scientific purposes, to compare with single source chocolate from Peru and Bolivia. It’s all pretty tasty. Three young men wanted to rap to us for a tip and were unhappy to find us hot and tired and uninterested in rap. Some people enjoy these performers, and pass by the entrance to the fort to see whether the trumpeter will guess their nationality and play the national anthem of their home country. We stuck to the UNESCO World Heritage site portion of the city. It is lovely, though touristy, a bit like the French Quarter in New Orleans, or the Casco Viejo in Panama, and makes a pleasant day trip. Though most people are pretty low key here, you see that some people are struggling. Like the young rappers in Cartagena getting up close hoping for a tip, fruit-sellers rush to your window when you stop along the highway. There’s a touch of desperation in their desire to sell you something. It can be overwhelming to be offered a bag of mangoes by five different people at the same time. Even if you wanted mangoes, how would you choose? No one moves fast in the Caribbean, it’s too hot. Barranquilla and the surrounding area rarely gets below 30⁰C (80s℉). This was our first lesson, as it took almost an hour to pick up our rental car. There were no problems, just an endless stream of information written on paper, xeroxed, typed into a computer, printed, signed and fingerprinted. 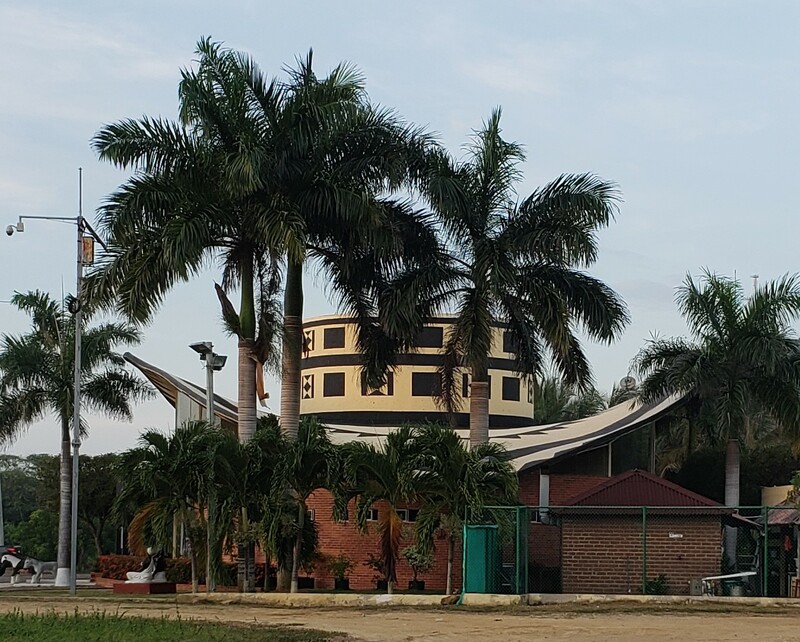 We managed to get around Barranquilla on its ring road before rush hour took serious hold and made it to our new place in Tubará. The next day we took a long walk on the beach, did some beachcombing and headed for the store with a shopping list for the rest of our stay. With vague directions, we drove toward Cartagena and toured a bit of the region, ending up at a small grocery store in Juan de Acosta. Remarkably, we found everything on our list. One of the local landmarks is The Sombrero, a restaurant, store, roadside stop. We stopped at a woodworking stand where the owner showed us a wood sink basin he was carving. It yielded bright yellow sawdust. The wood is called Golden something for the color. 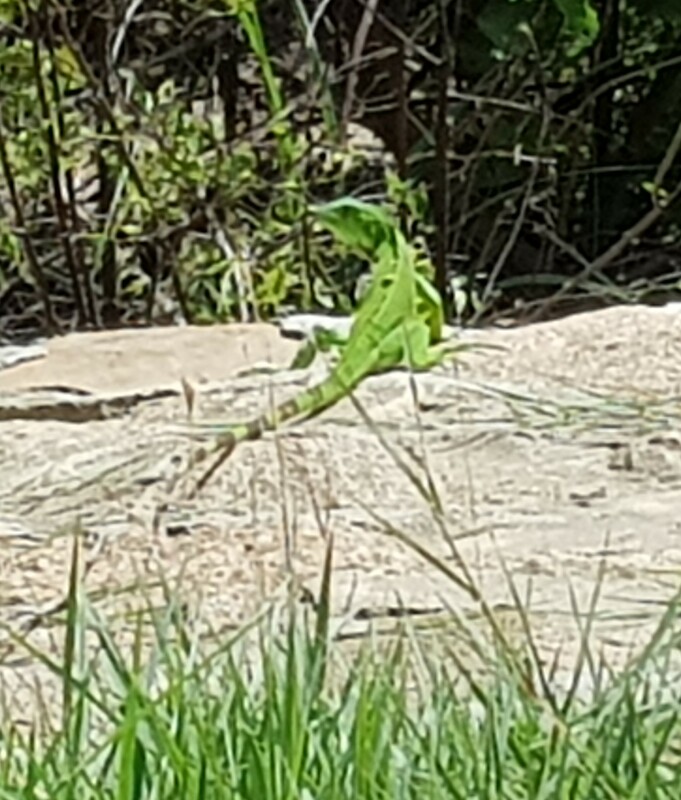 We saw a few birds and are still waiting for more of the local fauna to step out. The beaches are highly varied. 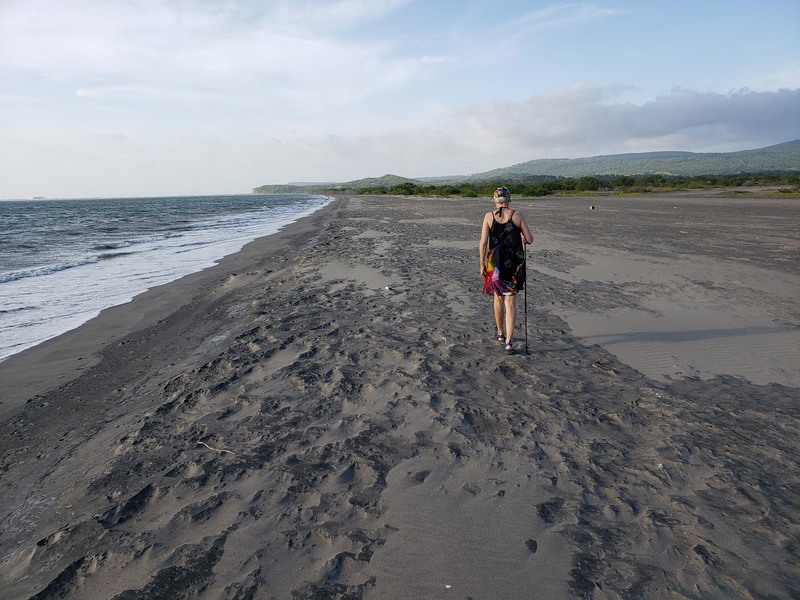 There are barely any waves on Playa Cano Dulce, the closest to our house. One arm of a long bay, Ensenada de Trebol, shields the beach. When we went out to the sea side of the Ensenada we found an astonishing beach full of driftwood. There are huge logs and twisted shapes of all kinds. 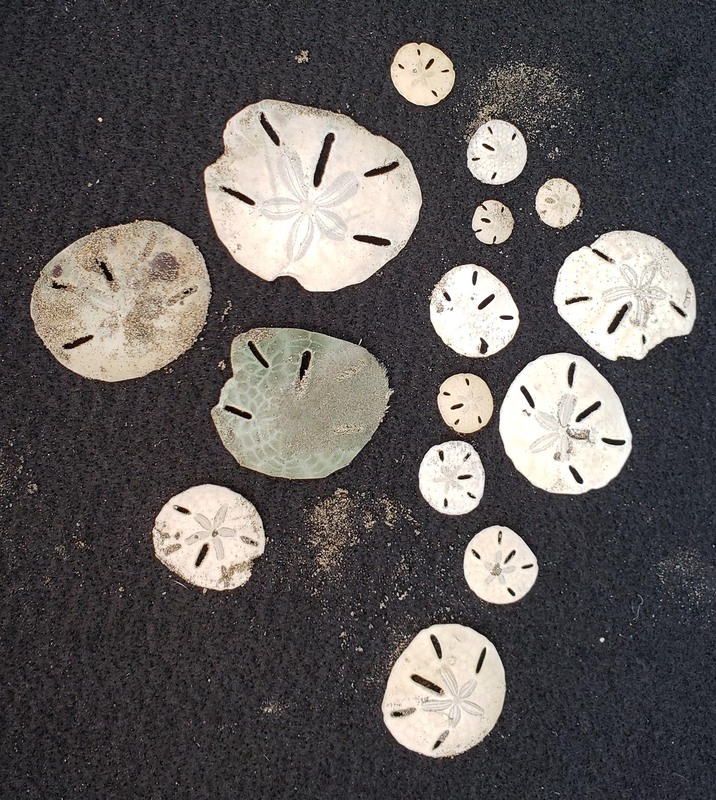 The next day we visited Playa Mendoza, where we found sand dollars. What would it be like to live in this region? Getting used to the heat is the biggest hurdle. It makes most sense to go out in the morning and evening and stay home in the shade in the middle of the day. 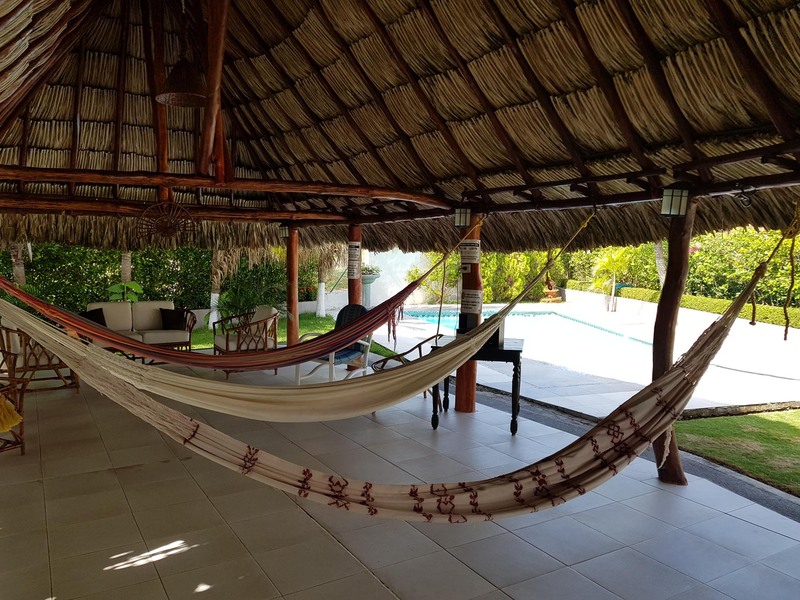 You wouldn’t need to worry about getting to the office and into the air-conditioning at work because no one commutes to Barranquilla from here. Our house this week is a “casa campestre,” part of a development of vacation homes. On Saturday and Sunday we can hear the voices of people on the beach. At night there is music. Weekdays we are alone apart from the caretakers. We had to summon someone to open the gate to the beach on Monday morning. 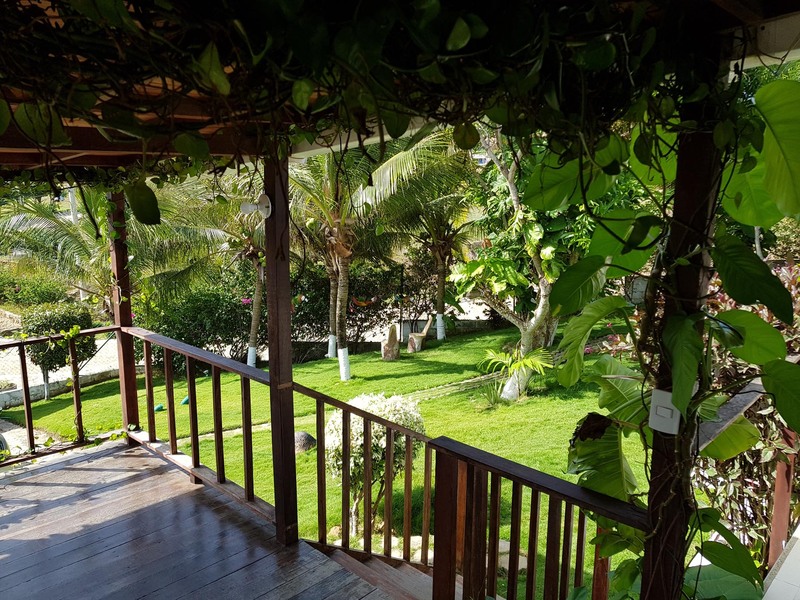 The people who live in this area full time are those who staff the beachside businesses, teach kite-surfing or build new villas for the weekenders, as development extends ever further along the coast between Baranquilla and Cartagena. The pace of life suits us fine, as we visit beaches in the morning and late afternoon. We are at home for a dip in the pool, lunch and rest in the shade while it is hot. 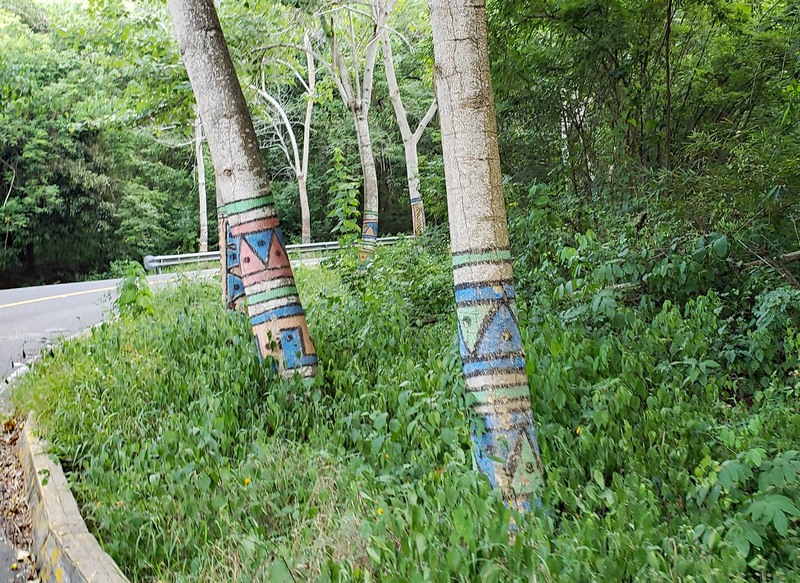 We drive through the Colombian countryside alongside the Magdalena River in a tiny cab. 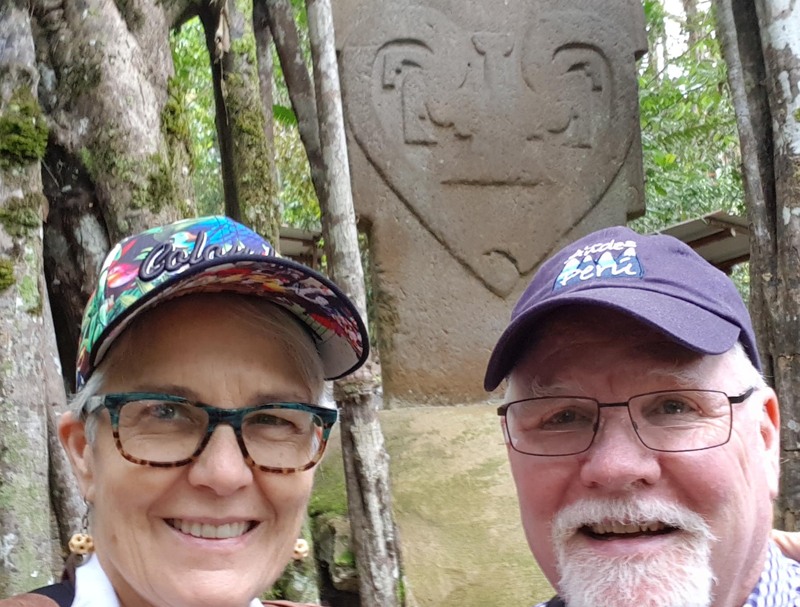 When we met Hugo and his taxi at 9 am we were glad we decided to leave our big suitcases at the hotel in Neiva and travel with our carry-ons for our two-day trip to San Agustin. 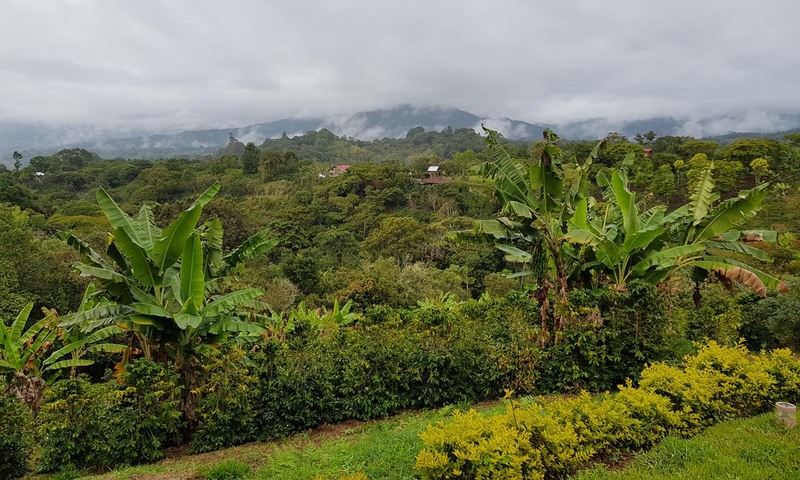 Other than the occasional swerve when we go over a bump or hit a pothole we are doing well, seeing rural sights as we make our way toward the archaeological sites of the San Agustin region. We were doubly happy that we hired Hugo to drive when his car was struck by a branch about a half hour out of Neiva. He stopped and negotiated with the trimmers from the electric company and we continued on our way. Crops of all kinds are out the car windows. 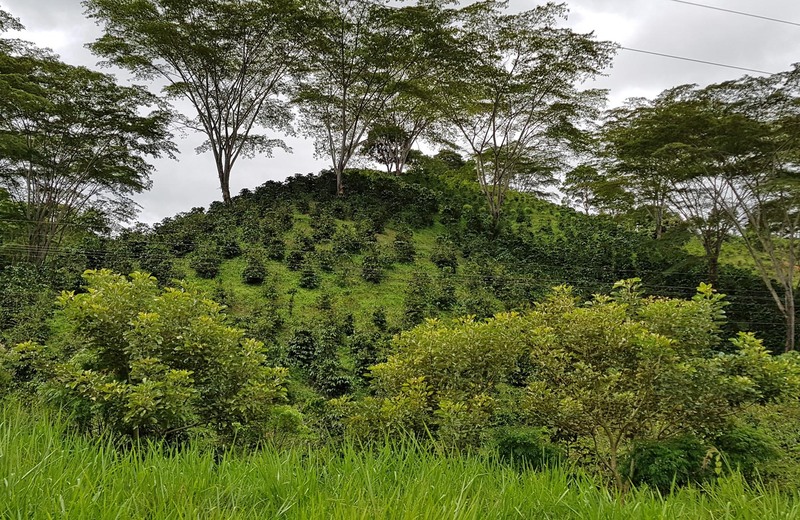 Colombia grows fruit, vegetables, ornamental plants and cut flowers. In addition to pineapple, banana, watermelon and papaya at breakfast, we tried juice of lulo (ugh) and cholupa (yum). Passing through Campoalegre we saw cacao beans drying on the sidewalk. There are lots of combination businesses, like photocopies and coffee, or parking and coffee. Here’s a reason to eat less beef and drink more coffee. The drive to San Agustin takes five hours. We arrived tired and had trouble finding the hotel, which is a lovely hacienda with a small chapel that gives it the name Hotel Monasterio. It is about a half mile past the end of the paved road and has no sign so when we found it we were delighted, though it was more isolated than we expected. No one was available to drive us anywhere. We renegotiated our agreement with Hugo so that he drove us to see the sites as well as the coming and going from Neiva. Before unpacking or rest, we found that we could follow a tour group to one of the other sites, Alto de los Idolos. Alto de los Idolos was about a half hour drive away, again further than we imagined, but well worth it. In a manicured park, we visit huge carved stone monuments and tombs. 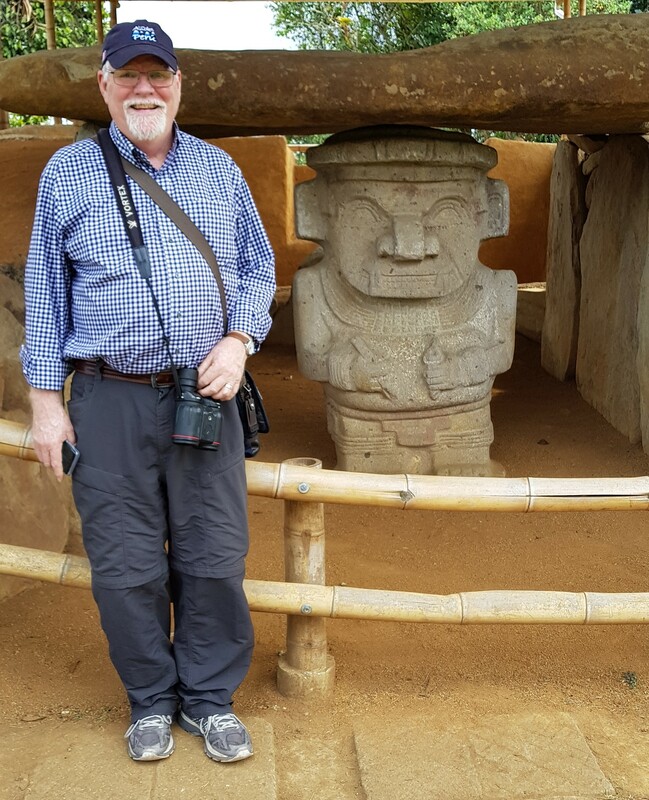 These were built by some of the earliest chieftains in the Americas, during the early Formative period, as early as 1000 BC. 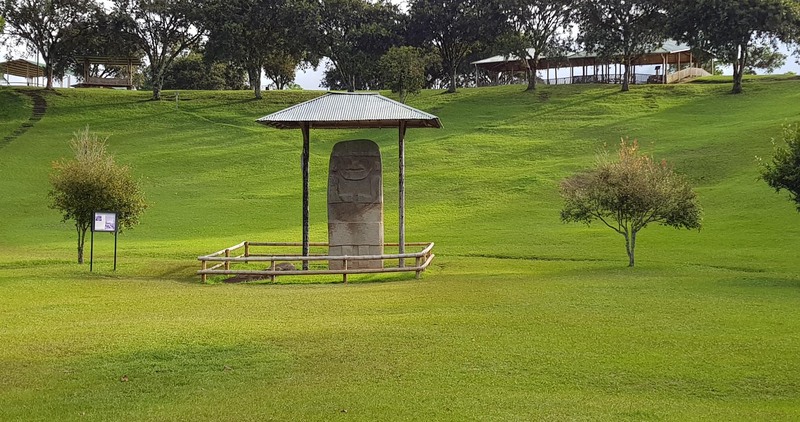 Large mounds were built to cover stone tombs, and carved figures guarded the entrances. We were at Alto de los Idolos just before sunset, and the setting sun lit the park in green and gold. We had dinner at the hotel and it was delicious, with the best-tasting broccoli I have ever eaten in a restaurant. There were fantastic birds around the hotel, red tanagers, yellow and green birds, hummingbirds that are dark blue and purple. We ate breakfast and looked out over the landscape. The mist in the distance rises off the Rio Magdalena, the huge main artery of the region. It did not rain on us despite the low clouds. 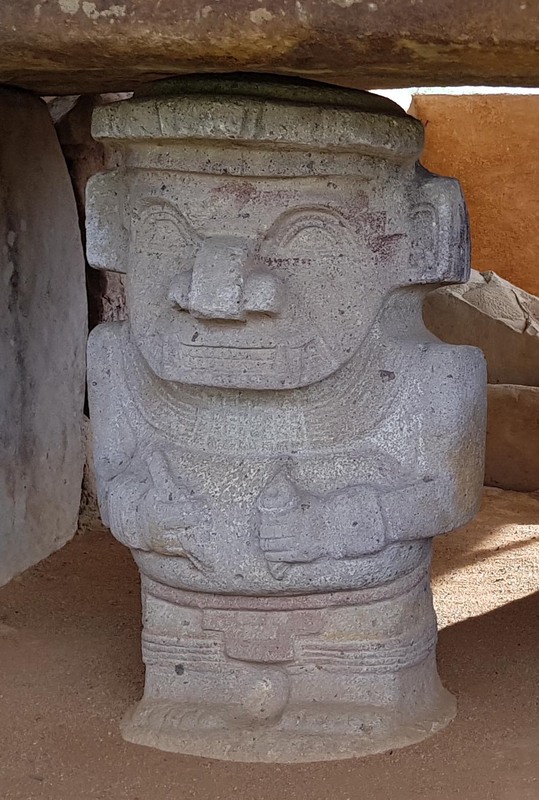 The San Agustin archaeological park encompasses four groups of stone monuments and tombs and an area of stream bed that was carved into channels and pools decorated with carved figures, the Fuente de Lavapatos. The monuments have focused themes. 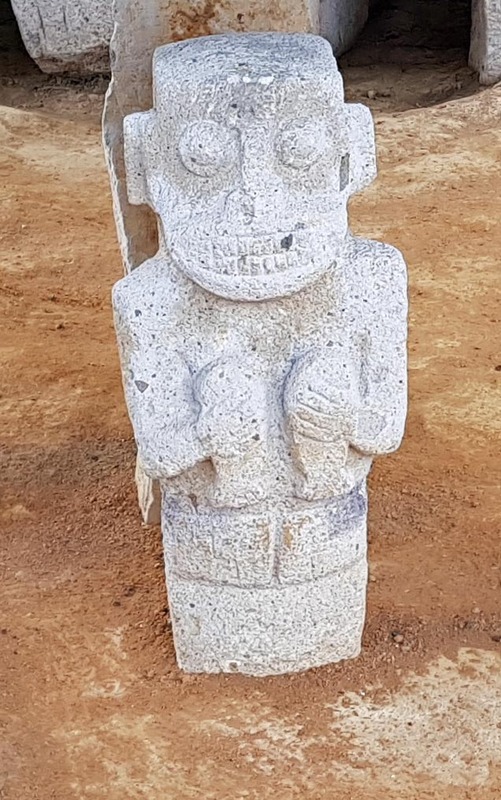 Each figure has large eyes, broad nose, fangs, claws and sometimes wears a helmet. The hands/claws are most often held close together and may be holding a captive (? ), two fish (? ), two staves, a cup, an arrow, a pencil (? ), an ice cream cone (?). There is also “The Thinker,” Colombia style. The entire circuit takes at least a half day to cover. Overcast weather made for a comfortable visit, and there were places to stop for coffee and souvenir shopping. I had a fresh ginger, lime, mint tea that was delicious. We finished off with a selfie. We got back on the road again in the early afternoon for the five hour return trip to Neiva. For another view of visiting San Agustin, see this article in the NYT from last week. We seem to have visited at the same time! 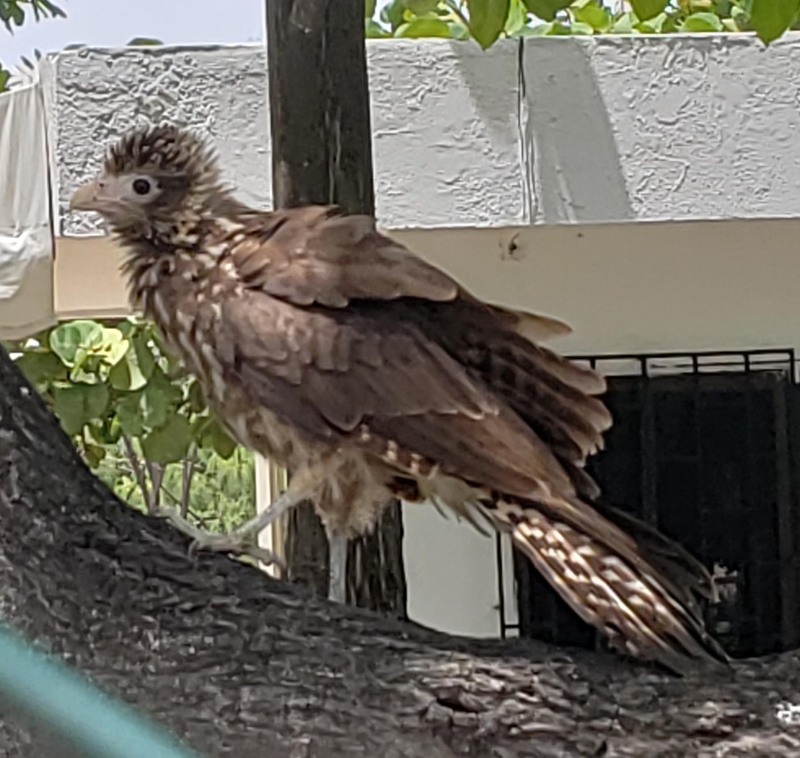 Our flight on to Barranquilla was the next morning at 10 am, so there was no time for a longer stay in Neiva and the San Agustin area, though there are many more things to see. 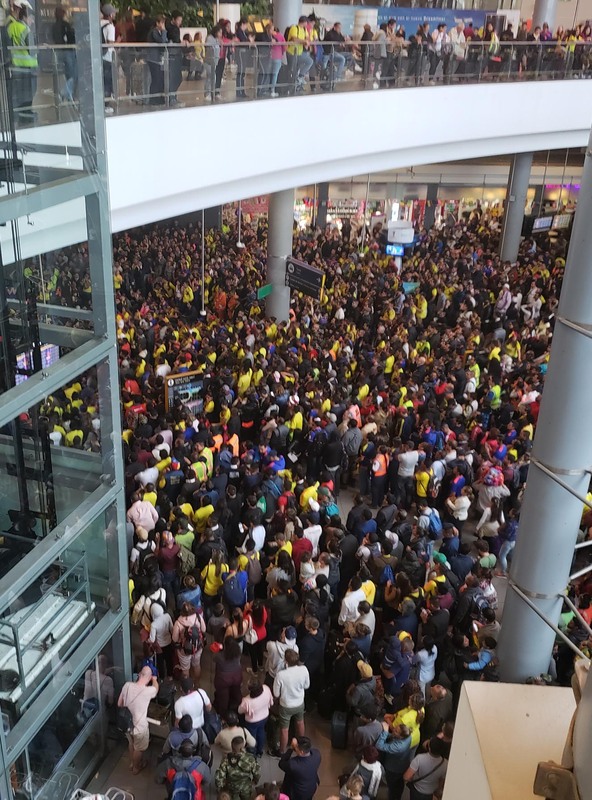 We did happen to be on layover in Bogota during the final moments of the Colombia-England game of the World Cup. Everyone was watching until the bitter end, when Colombia lost on the final penalty kick. 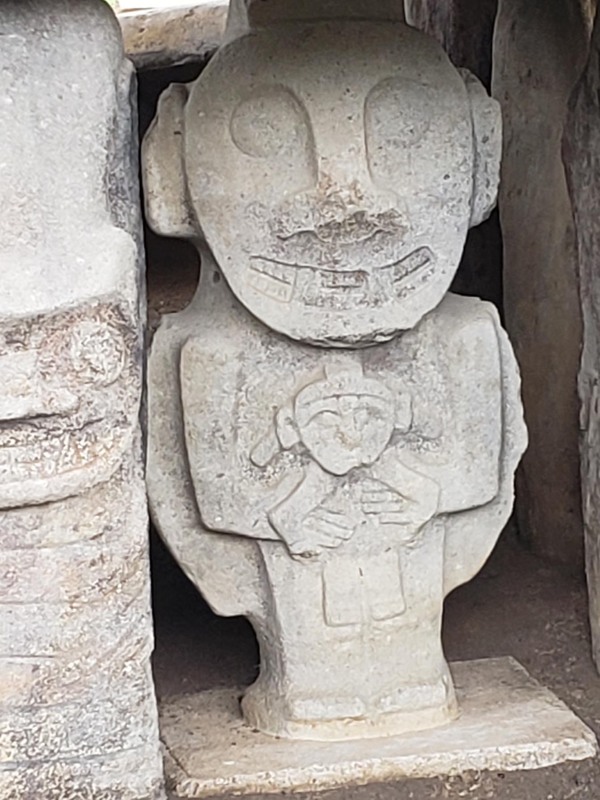 The San Agustin archaeological park encompasses four groups of stone monuments and tombs and an area of streambed that was carved into channels and pools decorated with carved figures. The monuments have a limited range of themes. The figures have large eyes, broad nose, fangs, claws and sometimes wear a helmet. The hands/claws are most often held close together and may be holding a captive (? ), two fish (? ), two staves, a cup, an arrow, a pencil (? ), an ice cream cone (?). There is also “The Thinker” Colombia style. We got back on the road again in the early afternoon for the five hour return trip to Neiva. Our flight on to Barranquilla was the next morning at 10 am, there was no time for a longer stay in the San Agustin area, though there are many more things to see. We did happen to be on layover in Bogota during the final moments of the Colombia-England game of the World Cup. Everyone was watching until the bitter end, when Colombia lost on the final penalty kick. It just happened to be sunset, lighting the park in green and gold. We had dinner at the hotel and it was delicious, with the best-tasting broccoli I have ever eaten in a restaurant. We were still in a panic about how we could have chosen a hotel so far from our destination. We double checked the map and discovered our error. 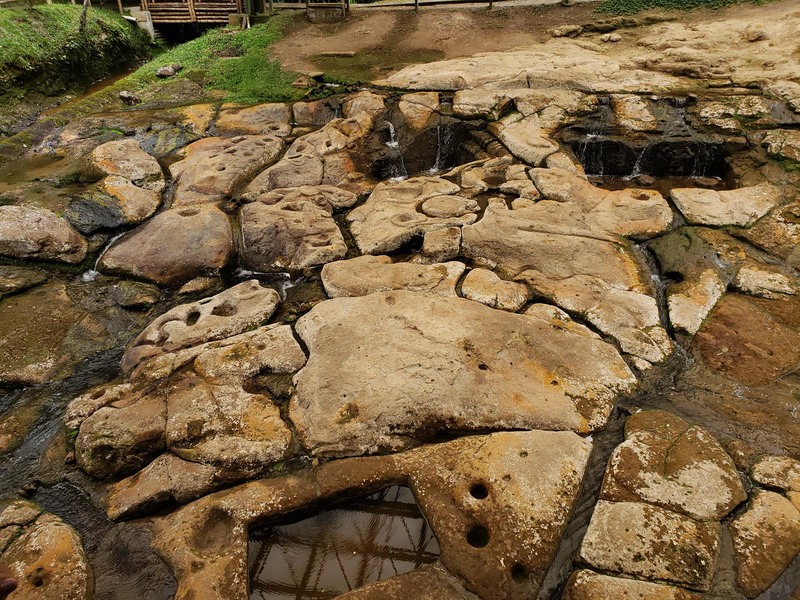 We are indeed only 15 min from the San Agustin archaeological park. It was an awful few hours, but now our visit tomorrow will be reasonable. There are fantastic birds around the hotel, red tanagers, yellow and green birds, hummingbirds that are dark blue and purple. We have breakfast and look out over the landscape. The mist in the distance is rising off the Rio Magdalena, the huge main artery of the region. So far it has not rained on us despite the low clouds. We came to Bogota for a single reason: to see the best gold museum in the world. The Museo De Oro is full of gold panned from streams around Colombia, hammered and cast into amazing shapes. 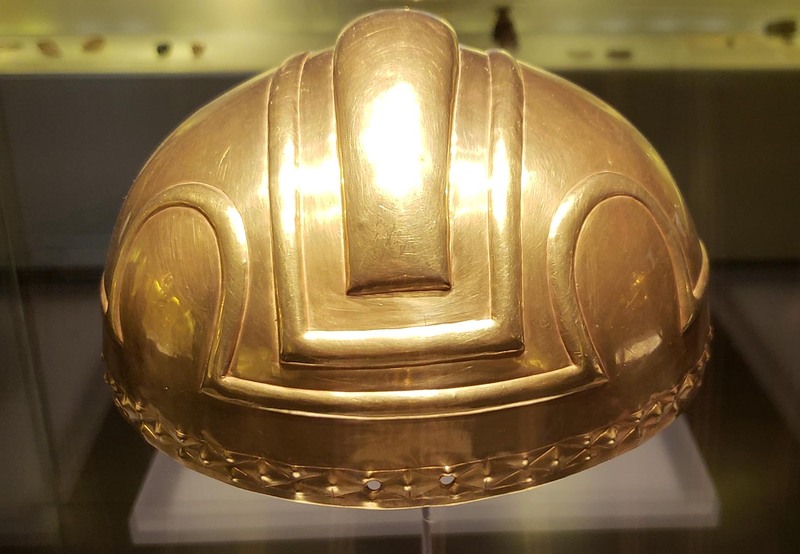 One of the fascinating parts of this history is that several regions of Colombia made gold objects in clearly recognizable styles. One of the first exhibits you see takes you through these areas. This could exhaust anyone. 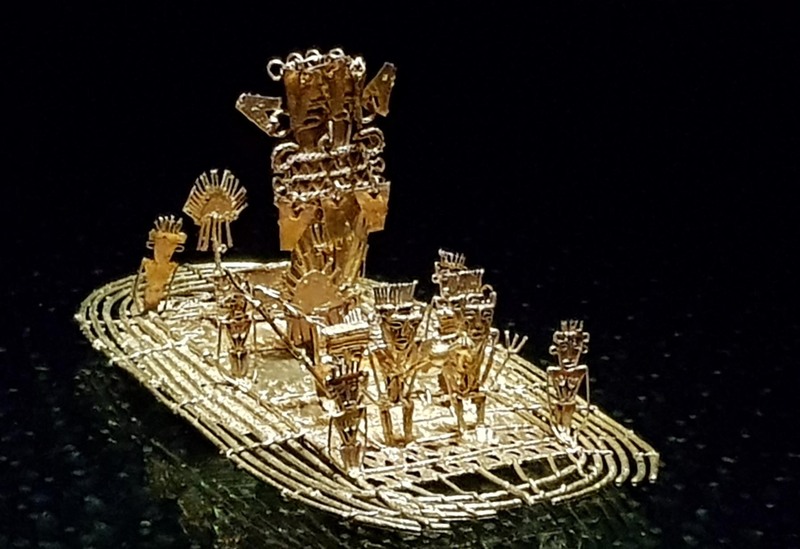 The Sinu style of gold-working used a lot of wire to make detailed shapes and poses, including the coolest gold artifact in the Americas, the golden raft. 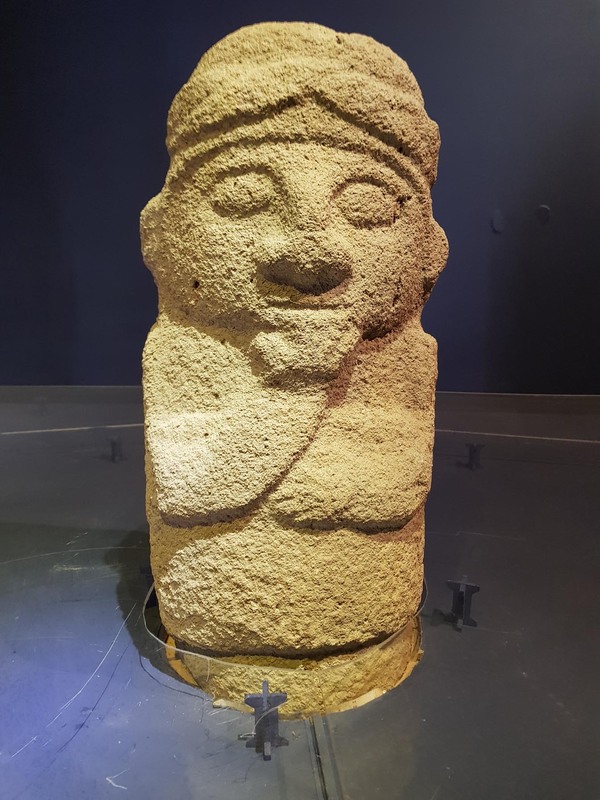 Quimbaya work was thicker than the others because they had more productive sources of gold. Pieces were made with exquisite detail. The museum has so many different artifacts that hundreds of them are shown in a very short light show. It’s difficult to take in how many pieces there are. There are a few chunks of Colombian emerald, too. This is a sample of what is in the museum. It’s worth a trip to Bogota. Our hotel in Bogota, in the historic Candelaria neighborhood, was lovely. Decorated with furniture from an elegant private home, The Orchids also served the best arepas we’ve eaten in Colombia.